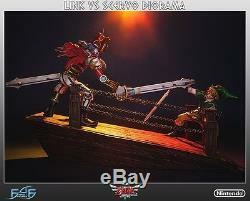 First 4 Figure è orgogliosa di presentare "Link Vs Scervo" Diorama. Direttamente da The Legend Of Zelda: Skyward Sword, Link e Scervo uno di fronte all'altro, intenti ad incrociare le spade sul Galeone di Sabbia. During The Legend of Zelda: Skyward Sword, Link finds himself on the decks of a long-forgotten battle galleon known as the Sandship. Whilst exploring the apparently abandoned vessel, Link encounters and crosses swords with Scervo: The mechanical pirate captain who guards the Sandships prized treasure. First 4 Figures is proud to present the Link Vs.
Straight from The Legend of Zelda: Skyward Sword, Link and Scervo stand on the bowsprit of the Sandship, locked in an intense sword duel to the death. The base is cast in high quality polystone that has been hand painted to produce an outstanding finish, and is the perfect way to display our high quality PVC figurines of Link and Scervo together! As well as the highly detailed resin base, this version of the diorama includes high quality PVC figurines of both Link and Scervo to complete the scene! Comes complete with deluxe full-color packaging, moulded foam interiors, a hand-numbered base and a card of authenticity. The item "The Legend Of Zelda Skyward Sword Link Vs Scervo First 4 Figure Diorama F4F" is in sale since Thursday, March 16, 2017. This item is in the category "Giocattoli e modellismo\Action figure\Anime e manga". The seller is "japanimeit" and is located in Firenze. This item can be shipped worldwide.